When I decided to start this blog one of the first things I did was head to my local library. The more I learned about Steampunk, the more I realized I had a lot of reading to do! I picked up a mix of classic sci-fi like H. G. Wells’ The Island of Dr. Moreau. but I had also heard good things about Cassandra Clare’s Infernal Devices trilogy so in I decided to read a mix of the old and the new at the same time. I’ve only gotten as far as the first book in the series, Clockwork Angel, but I will definitely be reading the trilogy to the end. 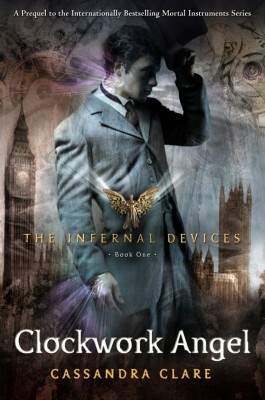 The Infernal Devices series takes place before Clare’s earlier trilogy (Mortal Instruments) about an angelically infused group of warriors fighting the forces of darkness to keep us “mundanes” out of the crossfire, but it is not meant as a prequel. (Clare stresses on her website that the books can be read in any order.) The story takes place in dreary streets of Victorian London and follows the misadventure of sixteen-year-old Tessa Gray. The story starts with her imprisonment in the hands of the strange Dark Sisters, who help her unlock her previously unknown supernatural talent. With the help of a deliciously malicious (not to mention handsome) rising Shadowhunter Will, Tessa escapes and finds herself sucked into a race against time to stop a clockwork army in the hands of the mysterious and powerful Magister. You can read and excerpt here. Next on my reading list? The Strange Affair of Spring-heeled Jack (a Burton and Swiborne novel).